BEIT LAHIA, Gaza — The morning after burying 19-year-old Abdul Fattah Abdul Nabi, his family gathered in a tent set up to receive mourners, watching and re-watching a video of the moment they say Israeli soldiers shot him in the back of the head. The teenager was one of at least 15 people killed in the Gaza Strip by Israeli forces on Friday during what Palestinian factions billed as a peaceful “March of Return” to mark Land Day, the anniversary of the expropriation of Arab-owned land by the Israeli government in 1976. But it ended as the bloodiest day in the 140-square-mile territory since the 2014 war between Israel and Hamas, the militant group that controls Gaza. Israeli Prime Minister Benjamin Netanyahu praised the Israeli military for guarding the country’s borders. “Israel will act firmly and decisively to protect its sovereignty and the security of its citizens,” he said in a statement Saturday. The Israeli military has warned that it will “expand” its response if violence continues. Hamas and other factions in Gaza have vowed to keep up demonstrations, raising fears of more clashes. Video posted to YouTube appears to show the moment Abdul Fattah Abdul Nabi was shot. Abdul Fattah’s family is among those demanding an investigation into the Israeli response to the protest, saying videos show he posed no threat. More than 700 people were injured with live ammunition in the demonstration, according to the Palestinian Health Ministry in Gaza. Forty-nine were wounded Saturday, it said. The United Nations on Saturday said it was “deeply concerned” and called for a transparent, independent investigation. The Israeli human rights group Adalah and the Gaza-based Al Mezan Center for Human Rights wrote to Israeli Attorney General Avichai Mandelblit to demand accountability. Israel said it stuck to strict rules of engagement to deal with a 30,000-strong crowd along the border, saying “rioters” threw molotov cocktails and stones, burned tires, and tried to break through the fence. The Israeli military did not immediately respond Saturday to requests to clarify the rules of engagement that were followed. In the days preceding the demonstration, the military dropped leaflets warning residents of Gaza to stay at least 300 meters from the border fence or risk being shot. Israel accused Hamas of using the cover of peaceful demonstrations to carry out attacks. Hamas said five of those killed were members of its military wing, releasing their names and pictures. Israel put the number of Hamas militants killed at eight, including a 20-year-old with a name similar to Abdul Fattah’s. Israel said two others among the dead also were members of militant groups. Abdul Fattah’s family said he worked in his brother’s falafel shop during the week and in a kitchen on Fridays. They said he did not belong to an armed faction. Unlike at funeral tents for dead militants, there were no signs indicating he had an allegiance to any group. Posters bearing his photo in the funeral tent showed him wearing a black bow tie rather than the military garb typical of fighters. The Israeli military did not respond to a request for comment Saturday to clarify the name discrepancy. His family, though, made no effort to hide the fact that Abdul Fattah went to demonstrations and threw stones. That was no reason for him to be shot, they said. Many demonstrators said they were there to protest peacefully. The family of 20-year-old Badr Sabbagh said he had just arrived to watch the demonstrations when he was shot. They rejected the Israeli army’s assertion that everyone killed was involved in violence. 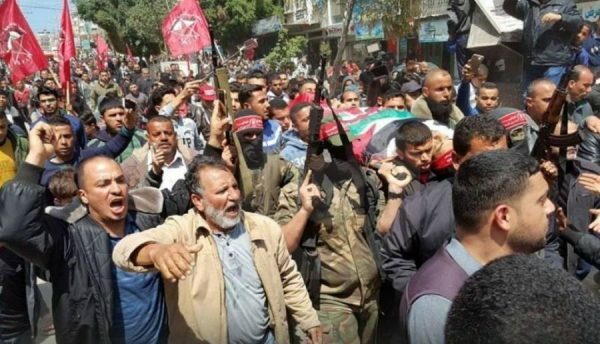 The demonstrations, which Hamas and other Palestinian factions hope to sustain for another month and a half, had subsided Saturday, with thinner crowds at the border than a day earlier. Israel will target militants in Gaza if violence along the territory’s border with Israel drags on, the chief military spokesman warned, a day after 16 Palestinians were killed by Israeli fire. Two other videos circulated online showed the shooting from different angles, while witnesses said Abdul Fattah was clearly running away from the fence. Palestinian photographer Mahmoud Abu Salama was taking pictures at the time and captured Abdul Fattah’s last moments. He said a man seen wearing a green shirt in the video had run toward the border fence to retrieve a tire left there earlier in the morning. He is seen in the video crawling on his belly toward the tire, then picking it up and running back to the crowd as bullets kick up dust around his feet. As he stumbles, Abdul Fattah runs to help him and grabs the tire. Abdul Fattah was shot from behind a few hundred meters away from the fence, Salama said. But he had little hope that anyone would be held accountable, a sentiment echoed by the Israeli human rights group B’Tselem. Abdul Fattah, like the majority of Gazans of his generation, had never left the Gaza Strip. Israel has imposed tight restrictions on the movement of goods and people since Hamas took control of the enclave in 2007. Over the past year, though, the United Nations has warned that the humanitarian situation in Gaza is rapidly deteriorating, adding that the economy and services may collapse. The unemployment rate is estimated to be about 50 percent. Israel blames Hamas for the worsening humanitarian situation, saying the group diverts money it should use for the benefit of its civilians to nefarious military activities. Reports say Kuwait’s call at the UN for an independent investigation into Gaza killings. Is the UN better equipped this time than in similar cases in Syria? This year, the Jewish Passover falls on the same weekend as the Western (Catholic) Easter, the security arrangements are high, including the Gaza border. This year the Christians from the Gaza Strip are without permits, Gaza Strip that is controlled by Hamas is a home of about 1,000 Christians, most of whom are members of the Greek Orthodox Church. Just before Easter began, they were still waiting for travel permits from the Israeli military authorities to celebrate Easter in Jerusalem or the occupied West Bank. The Gaza Strip has been sealed off by Israel and Egypt for over ten years, severely restricting people’s freedom of movement. “We’re still waiting, though it does not seem like we’re going to get approval this time,” says Mazen, a Christian from Gaza who does not want to see his real name mentioned because he’s waiting for approval. The Easter celebrations of the Christian Orthodox community take place this year a week after the Catholic Easter. Then again Christians from all over the world come to Jerusalem to take part in the ceremony of the Holy Fire in the Jerusalem Church of the Holy Sepulcher. Every few meters along the narrow streets in the old city Israeli police and border guards are posted, a few streets are temporarily closed off completely for the procession train. As the pilgrims go on praying and singing, the inhabitants of Jerusalem seek to pursue their daily lives. In between the Muslim faithful on the way to the midday Friday prayers.